Ftrack, an online project management platform for creative collaboration, has added new integrations for Maxon Cinema 4D and Autocad 3ds Max. The integration enables users to access projects, publish and import files, and manage activities via an Ftrack panel implemented into the user interface. 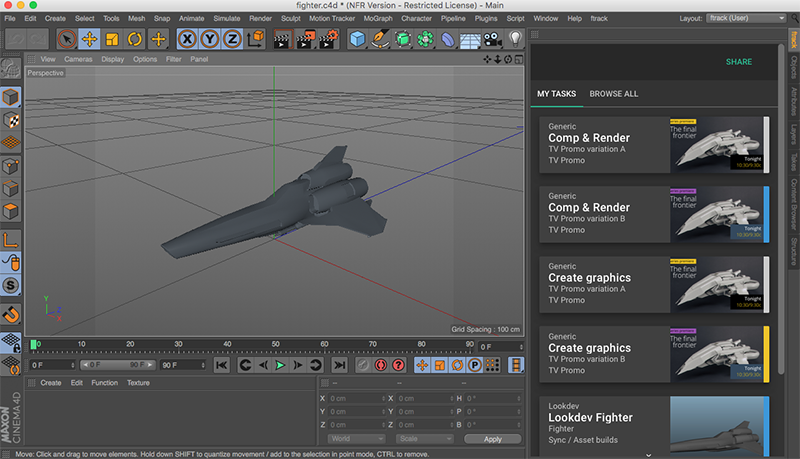 “Cinema 4D projects can grow incredibly complex. An integration with ftrack is therefore hugely beneficial – its organisational and collaborative workflows empower Cinema 4D artists’ creativity, enabling them to concentrate on design, imagination and ideas, rather than the administrative chores that ftrack effortlessly takes care of,” said Oliver Meiseberg of Maxon. Instant access to project management – Gain a simplified overview of your assigned tasks from the ftrack panel within Cinema 4D. Browse and drill down into any project. Dive into details – Easily access task information, notes and published files from the ftrack panel in Cinema 4D. Import tracked files from ftrack or share notes. Ftrack integration with Autodesk 3ds Max is also now available, featuring similar functionality as the existing Autodesk Maya and The Foundry NUKE integrations.